When the pressure became too much I popped my head out of the door and caught the attention of Ms. Cannon, my school’s Chief Academic Officer. My face must have communicated my situation, because without a word she rushed into the room. I proceeded to have my first breakdown of the year. I couldn’t do it, I told her. The work was too much. Between the lesson plans, hallway and cafeteria duty, and 6 AM – 6 PM hours, I was breaking. Between gasps of air and heaving sobs, I told Ms. Cannon that this was the first time in my life when I couldn’t work my way out of a hole. I’d been used to just buckling down and burrowing through whatever obstacle sat in my way. I didn’t know what to do. Without uttering a word she took a seat and listened. As soon as I finished she asked what I needed. I wasn’t sure, I said. Okay, she replied, let me help you plan the next two weeks’ worth of lessons. Will that be enough time to get yourself above water? I nodded. Great! she exclaimed with a smile. Within minutes my eyes were dry (enough) and I was delivering a brief presentation about myself to a standing-room only crowd of eager parents. I never did manage to get ahead of my work, but that didn’t matter. From that night on Ms. Cannon would provide me with guidance invaluable to my development as a professional. Ms. Cannon was always willing to listen to me talk. As part of my school’s professional development plan, Ms. Cannon met with individual teachers every week to discuss lesson plans and data results. She would listen to my fears, assuage my doubts, and ensure that I had the resources I needed to continue on my path. I also spent hours sitting in on Ms. Cannon’s classes, typing up extensive notes on everything she did. Whether she was handing out papers, leading a discussion, or encouraging students who were having a rough day, Ms. Cannon exemplified the teacher I wanted to be. Witty. Passionate. Respectful. And in complete control of her content and teaching pedagogy. At this point in my career, I’ve been fortunate to find individuals who don’t mind answering my questions or pointing me in the right direction when I’m stumped. I wrote about some of them earlier in the year. But unlike the educators I wrote about in that post, Ms. Cannon and I no longer have contact. After I left the school our communication ended. Our time together changed me in powerful ways. She helped me become myself. Scholars such as Gert Biesta and Hannah Arendt have spoken of education as a process of becoming. The concept tasks teachers with creating spaces and activities that push students to articulate who they are. Education as becoming cannot be static. Nor can it result from a sole focus on content memorization. We must take risks and confront that which challenges us. Only by responding to what is challenging can we articulate ourselves into existence. Ms. Cannon pushed me to articulate who I was. The school in which we worked was filled with amazing teachers, and as a new teacher I wanted nothing more than to replicate the success of my colleagues. Every few months I would take on someone else’s mannerisms, vocalizations, and body language. I thought that if I could only act like someone else I would be able to feel successful. Ms. Cannon helped me recognize myself and develop a teacher identity free of mimicry. Never underestimate the power of being told that you’re good enough. A recent status update on Facebook inspired me to write this post about my time working with Ms. Cannon. I took the above screenshot of two voicemails she left on my phone a number of years ago. Like other Millennials, I find voicemail about as useful and appealing as landline telephones. But I’ll probably hold onto Ms. Cannon’s two voicemails for a long time. I haven’t listened to them in years; I don’t really need to. The time that these voicemails come from no longer exists, but they still resonate with power. Expressing gratitude to someone you no longer keep in contact with is an interesting endeavor. The intended audience and purpose of this post are somewhat murky. It feels important to continually ground myself in gratitude and acknowledge everyone who has helped me along the way. I’m reminded of the quote (often erroneously attributed to Maya Angelou), “They may forget what you said, but they will never forget how you made them feel.” I no longer remember much of what Ms. Cannon told me. I cannot, however, forget the feelings of confidence and positivity she inspired within me. Our time together has come to an end. Four weeks of transformative lessons, discussions, partnerships, conflicts, and writing. I can’t say enough about the Writing Project. It is the greatest professional development I have ever attended. Teachers teaching teachers. Becoming true scholars of the content we teach. Creating lesson plans and assignments that align with our hearts minds, not a scope-and-sequence template. Summer institute reminded me that teaching is a glorious burden. A commitment to understanding children, adults, and everyone in between. That it is a path best walked with each other. We are the guardians of our profession. We are the final arbiters of what happens in education. Meaningful unity begins now. 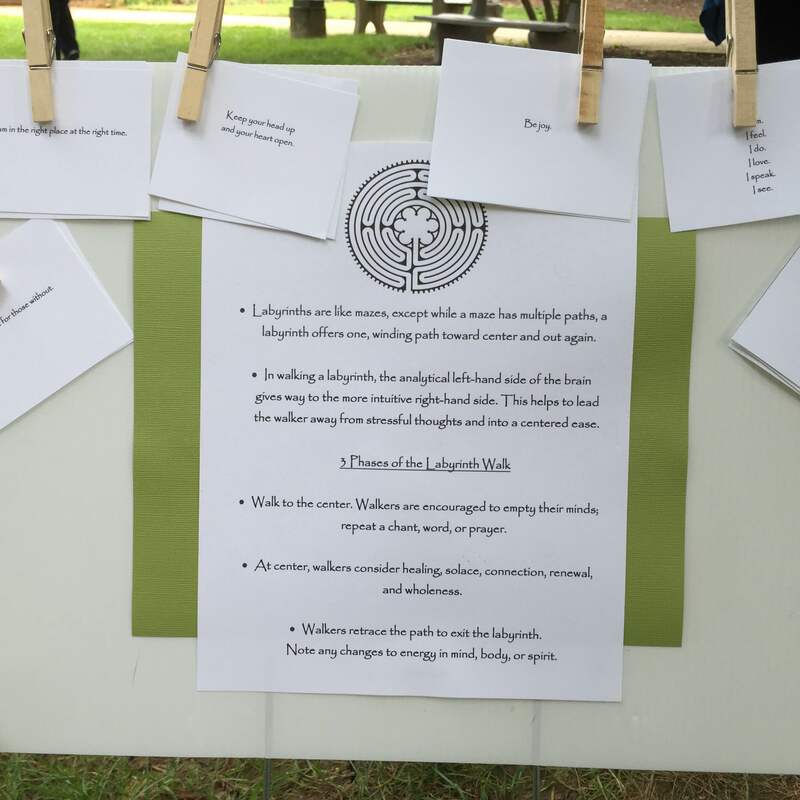 We begin our final day by walking a mindfulness labyrinth made of stones and sticks. 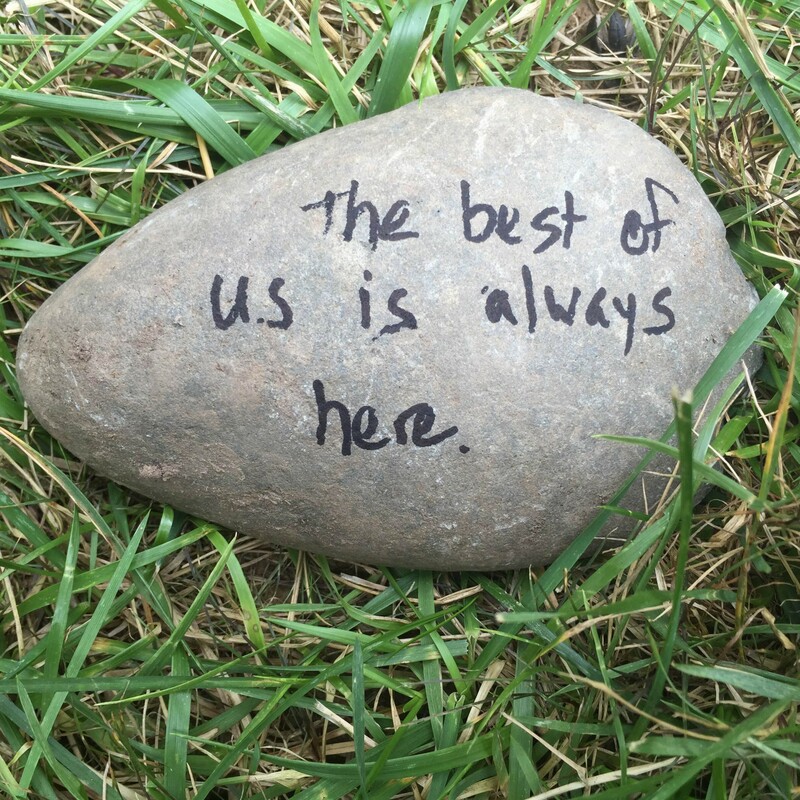 Everyone writes a message of strength and clarity on a rock and adds it to the pile. Afterwards, we write. Whatever we want to write.